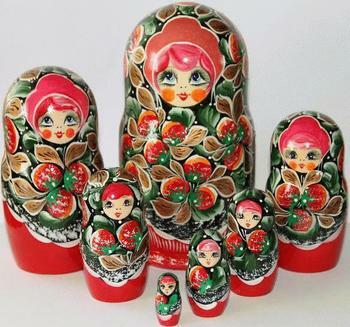 Traditional handmade Russian wooden nesting dolls matryoshka with strawberries painting, set of 7 pieces. Height of largest doll is 20 cm. We at C2A Enterprise are selling a wide variety of handmade Russian crafts, jewelry and other products. We are also selling handmade ethnic products from other countries.